Guess What? Dr. Will Tuttle an international award-winning inspirational speaker on human health and the environment is visiting India as part of his Global Talk Series. A visionary author, educator and pianist, Dr. Tuttle has presented widely throughout North America, Europe and the Pacific to promote awareness about the environmental crisis confronting us all, and the powerful ways we each can affect it through the choices we make about our food. 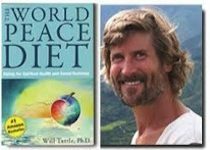 Dr. Tuttle is the recipient of the Peace Abbey’s Courage of Conscience Award and the Empty Cages Prize and author of the Amazon best-seller “The World Peace Diet”. As the creator of eight CD albums of uplifting original piano music, Dr. Tuttle will also play the Piano along with his spouse Madeleine, a Swiss artist and musician. Join us for a transcendental cultural evening brought to you in co-operation with Satvik Vegan Society, Millie’s, JustBe, The Green Path, My Wellness Game, PETA India, Roshni Sanghvi, Carrots, Veganarke, The Happy Calf, PHC Life Style Clinic, Forum for Teachers of Western Classical Music, Swaastya, St Marks Cathedral. This is a free event but registration is a must.